This article is about the year 1477. Wikimedia Commons has media related to 1477. The situation of 1477, with Calais, the English Pale and neighboring counties. Year 1477 (MCDLXXVII) was a common year starting on Wednesday (link will display the full calendar) of the Julian calendar. January 5 – Battle of Nancy: Charles the Bold of Burgundy is again defeated, and this time is killed; this marks the end of the Burgundian Wars. February? – Volcano Bardarbunga erupts, with a VEI of 6. 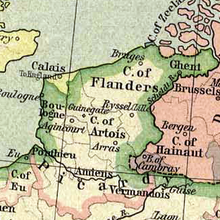 February 11 – Mary of Burgundy, the daughter of Charles the Bold, is forced by her disgruntled subjects to sign the Great Privilege, by which the Flemish cities recover all the local and communal rights which have been abolished by the decrees of the dukes of Burgundy, in their efforts to create in the Low Countries a centralized state. February 27 – Uppsala University is founded, becoming the first university in Sweden and all of Scandinavia. August 19 – Mary of Burgundy marries Maximilian I, Holy Roman Emperor, in Ghent, bringing her Flemish and Burgundian lands into the Holy Roman Empire, and detaching them from France. November 18 – William Caxton produces Earl Rivers' translation into English of Dictes or Sayengis of the Philosophres, at his press in Westminster, the first book printed in England on a printing press. Ivan III of Russia marches against the Novgorod Republic, marking the beginning of Russian Colonialism. Giovanni Pico della Mirandola starts to study canon law, at the University of Bologna. Thomas Norton (alchemist) writes Ordinall of Alchemy. The first edition of The Travels of Marco Polo is printed. ^ Heimann, Heinz-Dieter. Die Habsburger: Dynastie und Kaiserreiche. pp. 38–45. ISBN 3-406-44754-6.